Size: 11.5cm* 12cm* 3cm, 100% Handmade. Easy to put money and mobile phone in it. The small design makes it easy to carry in your hand or toss inside your everyday tote bag or overnight travel bag. SIZE :4.52 (Long)* 1.18(Width)* 4.72(High) inch (Can not put any mobile phone). HAND MADE: Made of High Quality Silk with Cotton lining, Durable and comfortable to touch and feel. Brand New Clasp kiss-lock closure, easy to use, look good and practical. FIT WOMAN: This is a small bag that can hold your lipstick, Small cosmetics, keys and some coin change. 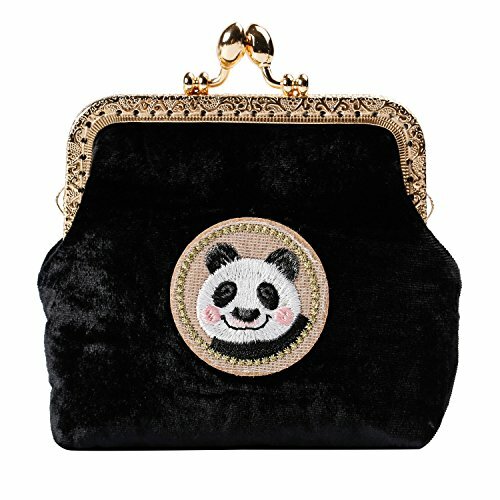 This wallet can be put in your big bag (or you can hold it in your hand), and when you come up with this bag you will be unique at any time and place. FIT GIRL: Small bag, can be used to give your child candy, pocket money, can also be used to hold keys and other small things, so that your child is no lost afraid to throw things away. because, A bag With a 47.24 inch length of the shoulder strap, allows your child to shoulder or Messenger this beautiful bag. GOOD GIFT: A good gift for family, friends and children is also a good choice for a Christmas gift. Pls confirm the size according to our description instead of the photos. If you have any questions about this product by Kigurumi, contact us by completing and submitting the form below. If you are looking for a specif part number, please include it with your message.